Did you notice the scroll bar in your WordPress editor is missing? Recently one of our users asked if it was possible to disable the full-height post editor in WordPress and bring back the scroll bar. 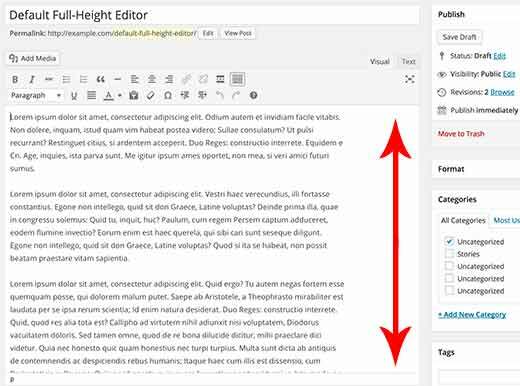 In this article, we will show you how to disable the scroll free full-height post editor in WordPress. 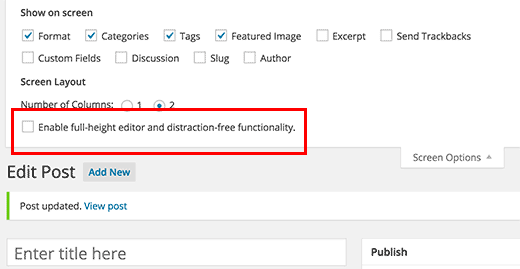 In WordPress 4.0, a new writing experience was introduced to the post editor. As you write, the height of the post editor would automatically adjust thus eliminating the need of the scroll bar. While that is great, it now means that you have to scroll through all the paragraphs just to reach your custom fields and other meta boxes such as SEO, Calendar, etc. Some users found this a bit confusing and irritating. If you want to disable the full height editor and revert to the old editor with scroll bar, then there is a very easy fix. Simply login to the admin area of your WordPress site and add a new post. On the post editor screen, click on the Screen Options menu on the top right corner of the screen. This will display a flydown menu with a number of options. Uncheck the box next to ‘Enable full-height editor and distraction-free functionality’. Unchecking this option will disable the full-height editor functionality. It will also remove the distraction-free functionality from the editor. That’s all. You can now enter your content in the post editor to see that your scroll bar is back just like the good ol’ times. You can also click on the bottom right corner of the editor to drag and adjust the editor size. 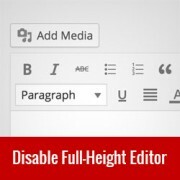 We hope this article helped you disable the scroll free full-height editor in WordPress. You may also want to check out these 14 tips for mastering the WordPress visual editor. How do you make other changes to the editor? Like make the categories window bigger/longer? Add more categories to Most Used categories, etc? Hi, please tell me, how i can rate my books posts, my site about books and novels. i also want to use this for rich snippet in google.